Ninety years ago this September, in fact on Monday September 25, 1922, a somber event took place at Macleod, Alberta. It was the funeral of Stephen O. Lawson. The town said goodbye to its former Chief of Police. His wife Maggie and their five young children Stephen, Peggy, Mary, Pearl and Kathleen said goodbye to their husband and father. Never again would his loving wife Maggie have her life partner to hold and confide in. Never again would his children have him to love and cherish. 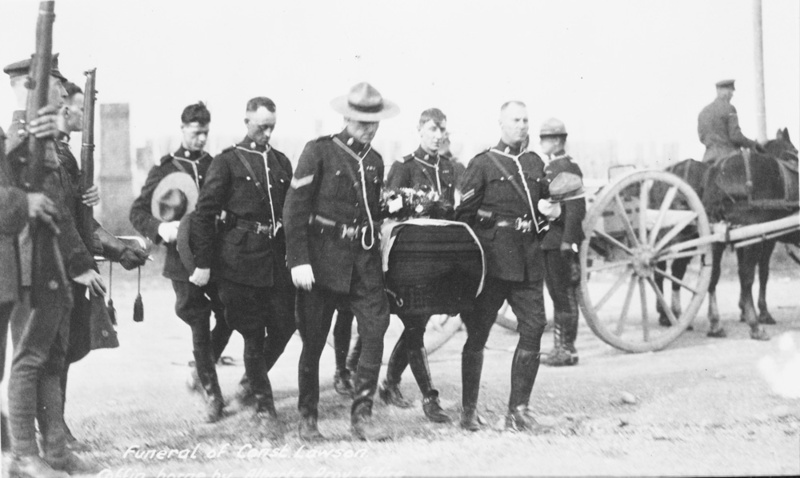 Constable Steve Lawson of the Alberta Provincial Police was gunned down in cold-blood on the previous Thursday evening September 21, 1922 outside his home and office at Coleman, Alberta. His wife and children witnessed his murder. When he collapsed fatally wounded and bleeding his family saw it all. They watched in horror as the life left his body. The so-called rum runners of the Crowsnest Pass killed him in their thirst for profit in the illegal liquor trade of the Prohibition Era. That Monday at Macleod, where Steve had been on the police force from 1908 until 1920, and chief for most of those years, the town and his family buried him in Union Cemetery with full military honours. Flags were flown at half-staff, most businesses closed, and schools dismissed such was the respect they had for one of their own. During his time in Macleod he met and married Maggie Rae McKenzie. There beginning in 1908 they had five children. The older children attended school in Macleod. Steve and Maggie took active roles in the community belonging to the Masons and other organizations. In Alberta history Steve Lawson seems to be only a footnote, but there was much more to this man. He emigrated from England in 1903. Settling in Macleod he worked briefly for the RNWMP as a Special Constable, Teamster, then he joined the Macleod Police force as a night constable and later became its chief. In 1916 he volunteered and went overseas with the CEF in World War I. He attained the rank of Sergeant, was wounded, and won the Military Medal for valor. He returned to Macleod as Chief of Police in 1919, but left to take the same position in Fernie, BC in May 1920. Then in March 1922 he was hired by the Alberta Provincial Police and posted to Coleman in the Crowsnest Pass. There he met his demise at the hands of the smugglers. You are currently browsing the WRITINGS & RAMBLINGS blog archives for July, 2012.